Leon Francis Goodchild was born in London on 22nd February 1923. However, in his teens he travelled to Birmingham and for the next 70 years has made it his home. Initially, Leon was a member of the Birmingham Roller Speed Club, who were based at the old Embassy Rink in Walford Road, Sparkbrook. Leon was totally dedicated to his sport and trained virtually non-stop in his quest to become a shining star. Despite his efforts success in the form of medals were not to be. Leon was widely recognised as a supremely strong speed skater, but his lack of any finishing sprint meant that gold would never come his way. These were the days before mass participation skating marathons and race distances were simply just too short for him. Five miles being the maximum distance competed over, his only racing success would be a silver medal in the 1951 Midland Counties Championship. By now a new club had emerged, the Midland Roller Speed Club. 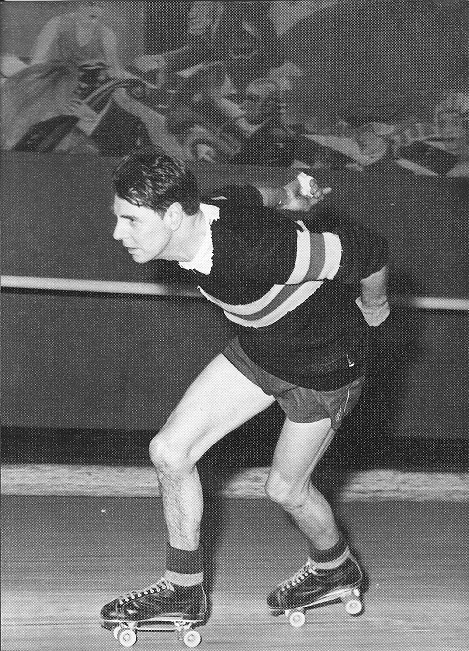 The club consisted of breakaway members from the old Birmingham Roller Speed Club and included the likes of World medallist Les Woodley and World Champion to be, Danny Kelly. In such highly rated company Leon would soon be looking to better his own achievements. The club motto "SPORT BEFORE SPEED" was no more so appropriate than for Leon. In 1958 he set new British Records for 10, 15 and 20 miles and a new 1 hour record. In 1959 he again set new records for these distances adding 25, 50 and the maximum 100 miles to his ever increasing tally. With a string of long distance British Records under his belt, by 1960 Leon had his sights firmly set on establishing a World Record. There were bigger and faster rinks now throughout the country, Brixton being the most popular for record attempts. However, as it had been for all his previous records, Leon was determined that the Birmingham Embassy should be the venue. He knew the rink inside and out, and after all, he was a Brummie! In June 1960, all the training and preparation had been done and Leon stepped onto the Embassy rink with a view to conquering the world. And he did just that. In those days measurements were taken both as imperial and metric, and Leon set World Records for 30km, 50km and 100km and 25, 30, 50 and 100 miles. Averaging over 19 miles per hour for the 25 miles and an almost unbelievable 18 miles per hour for 100 miles on roller skates on a 200 metre lap rink was a truly remarkable feat of both physical and mental endurance. Remember, these were the days of cup and cone bearings and wooden wheels just over 2 inches in diameter! These records stood for the next 10 years, but as true testament to just how remarkable this achievement was, Leon’s record for the 50km still stands to this day as a British Track Record, some 50 plus years on! At the age of 37 Leon had satisfied himself that speed skating was not just about winning gold medals. It was about personal achievement and being the best you could be. In his case, that meant being the best in the world! By the early 1970’s roller skating had seen a decline and with it the mass closing of roller rinks. The Embassy became a warehouse and the Mecca rink a car showroom. No new rinks were planned and Leon decided that if he was going to keep himself fit it would have to be in other ways and not on his beloved roller skates. By the early 1980’s the sport had moved on considerably. Races were now being held outdoors rather than indoors, but with the distinct lack of national facilities these were mainly on road circuits or car parks. Then in 1983 Britain had it’s first ever dedicated roller speed skating, state-of-the-art banked track. The location? Birmingham Wheels Adventure Park, Bordesley Green...a simple stones throw from Leon's house. The Birmingham Wheels Roller Speed Club was born out of the old Midland Olympic Club, and at the ripe old age of 60 Leon Francis Goodchild came out of retirement and showed the youngsters in the club just what hard training was. He helped coach the club youngsters and every Saturday he would be seen skating around the perimeter of the athletics track at Fox Hollies Leisure Centre, doing his customary 100 laps (about 30 miles!). Starting before the training session started, and finishing long after they had all gone home. He renewed his competitive membership and once again represented Birmingham’s speed skaters across the country and the continent. By now there were marathons, and at 67 years of age Leon took part in his first one…in Le Mans, France. The distance just over the 25 miles he was World Record holder of some 30 years earlier. By the 1990’s Leon had come to recognise, or rather his body had, that sometimes the ravages of time simply have to be succumbed to. He was now well into his 70’s and the years of skating those ultra-long distances had taken it’s toll, but still he could not let go totally. In 2005 Leon was eventually recognised as a true sporting hero. 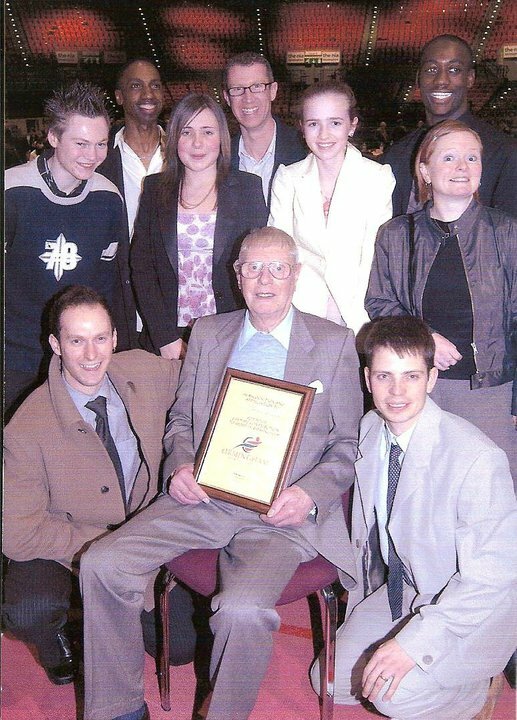 Aged 83 he was presented by the Birmingham City Sports Council with a "Lifetime Achievement Award" for services to his beloved sport and the community. An honour which he so truly deserved. For nearly 20 years Leon had been the Honorary President of the Birmingham Wheels Roller Speed Club in all it's guises. Sadly, in January 2007 Leon passed away after fighting a lengthy illness. His ashes are buried right opposite the START/FINISH line at the Birmingham Wheels track and a brass plaque bearing his name is displayed whenever the club hold a race there...remembering a time when Leon Francis Goodchild ruled the world!